see the 68’ by 193’ mural come to life for a slam dunk through augmented reality. Fans must install the Facebook mobile app to be able to view the AR experience. Facebook camera filters will transform the image of Smith Jr. on the wall of the Dallas YMCA building into motion video. The experience was built by creative technology studio Groove Jones and uses Facebook image recognition technology to activate when pointed at the giant mural. “We want our fans to be proud that we’re the first team to do something this big with augmented reality. 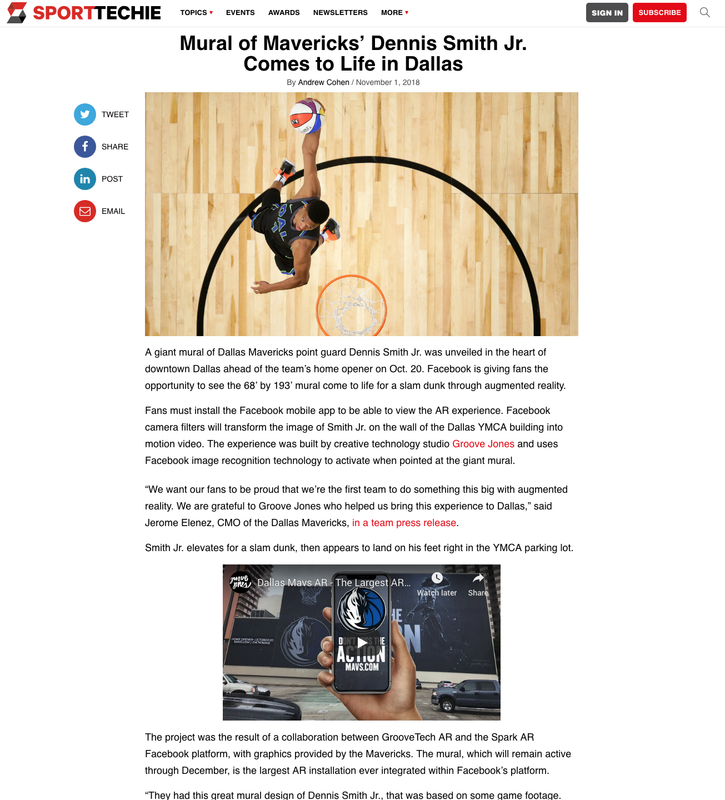 We are grateful to Groove Jones who helped us bring this experience to Dallas,” said Jerome Elenez, CMO of the Dallas Mavericks, in a team press release. Smith Jr. elevates for a slam dunk, then appears to land on his feet right in the YMCA parking lot. The project was the result of a collaboration between GrooveTech AR and the Spark AR Facebook platform, with graphics provided by the Mavericks. The mural, which will remain active through December, is the largest AR installation ever integrated within Facebook’s platform. “They had this great mural design of Dennis Smith Jr., that was based on some game footage. We loved the energy and action that was captured in the frame and we wanted to bring it to life,” said Dale Carman, Partner and ECD of Groove Jones, on the company’s website. Through augmented and virtual reality, the sports industry is exploring the next frontier of advertising to consumers in the digital age. This installation if one of the more creative ways a sports team has used AR to engage with fans. FOX also recently aired augmented reality ads for YouTube TV during its live broadcast of the World Series.